With two registered nurses on staff among our other caring and professional managers, Royal Columbian Retirement Inn senior services in Kennewick, WA, is quickly becoming known as one of the top places for care. Whether you are a senior in search of a great apartment with views and a private balcony or a family member researching assisted living options for a loved one, our community has the highly-skilled staff, training and atmosphere perfect for the varied needs of today's seniors. We offer independent and assisted living care and our fully-furnished apartments provide the ultimate choice in affordability and lifestyle needs. Independent Living: Our private senior apartments are the perfect solution for those ready to focus on the finer things in life without the hassles of chores and daily tasks like cooking and yard maintenance. This is a great option for social seniors looking to add entertainment, activities, and friends to their days. 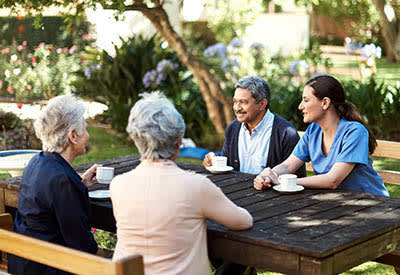 Memory Care: Residents of Royal Columbian Retirement Inn receive the care of specially trained staff and nursing members in our Meaningful Moments® program. We learn the individual life stories of our Alzheimer's residents and use them to bring deeper meaning to their days. Seniors at Royal Columbian Retirement Inn also have access to all of the features, amenities, and benefits of living in our retirement community.